I had to do it. I made yet another flag quilt. This quilt has been in the works for a little while and since it was finally delivered to it’s recipient, I am now at liberty to share the pictures without spoiling any surprises. You may remember my flag quilt blocks I started during the Olympics. They have been assembled into a quilt for one of my oldest friends (not that we’re old). E. and I have been friends for a long time – since we were 6 years old! And we’ve been obsessed with the Olympics ever since watching the Mary Lou Retton win the gymnastics gold medal in 1984. So it only seemed fitting to make a quilt, not only to commemorate our Olympic obsession, but also to commemorate countries we loved and visited together. Besides our Olympic obsession we also share a love of the UK – specifically London. (Here we are doing a very impressive Winston Churchill impression.) 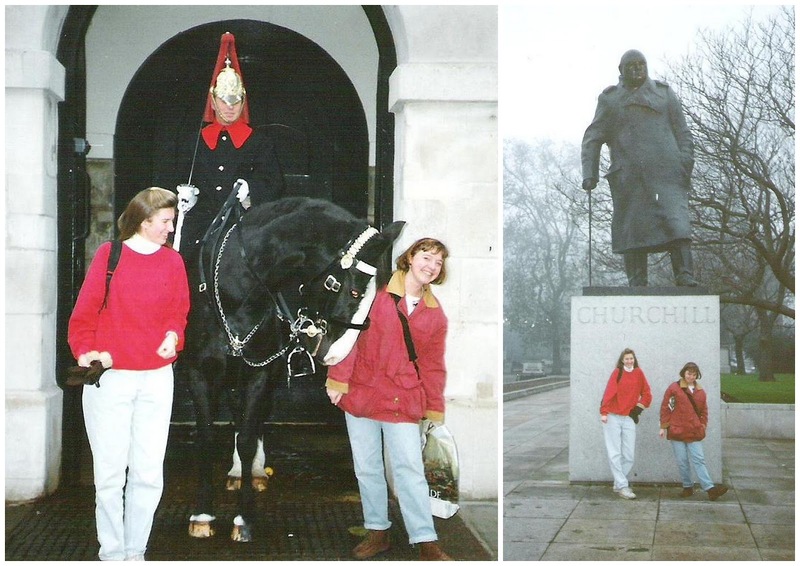 We lived in London as University students on a semester abroad in 1993. A while ago. Which you could probably guess by the baggy faded-wash jeans we are wearing. While living in London we also visited France, Scotland and Ireland. It was an amazing part of my life made that much better by sharing it with a very good friend. I was excited to discover the Cross of St. Patrick (bottom center) because I really wanted Ireland represented in this quilt, but orange and green were going to throw-off the whole color scheme. (I’m desperately hoping I haven’t sparked an international crisis or unintentionally offended anyone by doing it this way. I have made a an Irish tri-color flag quilt too. I have equal appreciation for all Irish flags…) Let me repeat, no offense was meant to any of the flags or the people of the countries represented here. A little over a year after we came home from living in London, E and I both volunteered as missionaries for our Church for 18 months. I happened to go back to England and E went to Taiwan. Even though we were far apart and in different cultures, it was neat to share that experience at the same time. I’m so proud of myself, I even made a label for the quilt! I got this print during the London games from Spoonflower when they were having a fq promotion. Perfect in so many ways. The adorable quilting was done by Melissa at Sew Shabby Quilting. I don’t have a pattern for this quilt. The Union Jack blocks are from the Victory Garden quilt pattern. I drafted all the other flags and made them the same size (I think 15″ x 20″) and then added strips to the tops and bottoms of the flags to create (9) 20″ square blocks. I did the same on the Norway flags quilt a few summers ago. I love to make quilts for people that I love. It’s one of my goals to be more proactive doing so. It’s been three years since I lost my friend Sarah and I’ve vowed ever since then, not to wait for the “perfect time” or occasion to give a quilt, but to just do it as soon as I can get my act together and make one. Wonderful job Amy! And I loved hearing the story behind the quilt. Your friend will LOVE her quilt, so symbolic of the times you have shared together. The variety of flags makes me think of a quilt Nanette made a few years back that represented her heritage. I would like to make some for my grandchildren. Beautiful! Now I am wanting to make a flag quilt with all of the places I have been!<br /><br />I went on the BYU Theatre Spring Study abroad in London in 1994. Amazing! I would love to go back. Oh my goodness. I love this! I&#39;m sure your friend will, too. Love, love, love. Can&#39;t wait to go back with both of you! I just adore your flag quilts. Maybe I&#39;ll make one too!! My sister and I visited Ireland (the only place I have been overseas.) I thing commemerating that into a quilt would be lovely. <br /><br />Thanks for the story too – always makes it that much more special! What an awesome quilt Amy!!! I love it!!! Absolutely wonderful. And I so agree, life is too short to wait to make a quilt for someone you care about. Fab gift, I&#39;m sure she loved it! Amy, that is so beautiful! I am sure she loves her quilt – I know that I would love it…if you ever want to make me one I glad accept (LOL). I love the photos too – it&#39;s fummy when you look back at old times and clothes, hair, shoes etc. For me it&#39;s usually about the really awful spiral perm, faded jeans and go-go ruffled skirts! that is so wonderful…and so full of memories…your friend must feel sooo special! The best quilt EVER! 🙂 I love it SO much, Amy!!! What a fantastic job, Amy!!! Looks like a gift that will be treasured forever! Yay for the Taiwan Flag!!! Thank you for quilting that! That quilt is gorgeous and so is the story that goes with it! Your &quot;old&quot; friend will love and cherish it!!! I had no idea that the UK flag is composed of three, that is really interesting. It was my country&#39;s (Canada) flag until I was 11 and we called it the Union Jack. It was such a difficult flag to draw because all the measurements are different. I love quilts with meaning. I really LOVED this quilt. The colors and the graphic quality of the flags really popped. I really enjoy checking your blog every few days. Thanks! What an awesome quilt with a great story!! I am sure your friend appreciates it! Amazing! Just wanted to share though that the union jack at sea thing is a not-so-urban legend, aka a myth! <br /><br />Thank you for your inspiring post! Really?? I was told that when I made my Union Jack quilt this summer and then I thought, &quot;Oh no! I&#39;ve offended all of Great Britain! So this time I need to get it right!&quot; Haha!